What was your ring experience like? S: Absolutely wonderful. My ring is beautiful, and unique, and totally me! It was a little big because I didn't know my size and therefore semi-lied to my significant other... but we got it sized down and taken care of so I can now wear it 24/7! C: I'm out of my league when trying to pick out jewelry, but Chelsea was able to take my basic ideas and give me several very beautiful options. I live 5 hours from Cincinnati but the distance was never an issue--Chelsea was easy to reach as we coordinated taking the ring from a design all the way to the finished product. Why did you choose Honey Designs for your ring experience? C: My fiancée has a friend who recommended Chelsea. I was shopping around online, but as soon I saw the unique ring that Chelsea could make, I knew that was the way to go. S: I knew the proposal was coming, but Chris moved pretty quick by his standards so it happened sooner than I thought! C: Given the money involved with engagement ring shopping, I didn't want any surprises! But I was very pleased with the ring we came up with, and my fiancée was too! 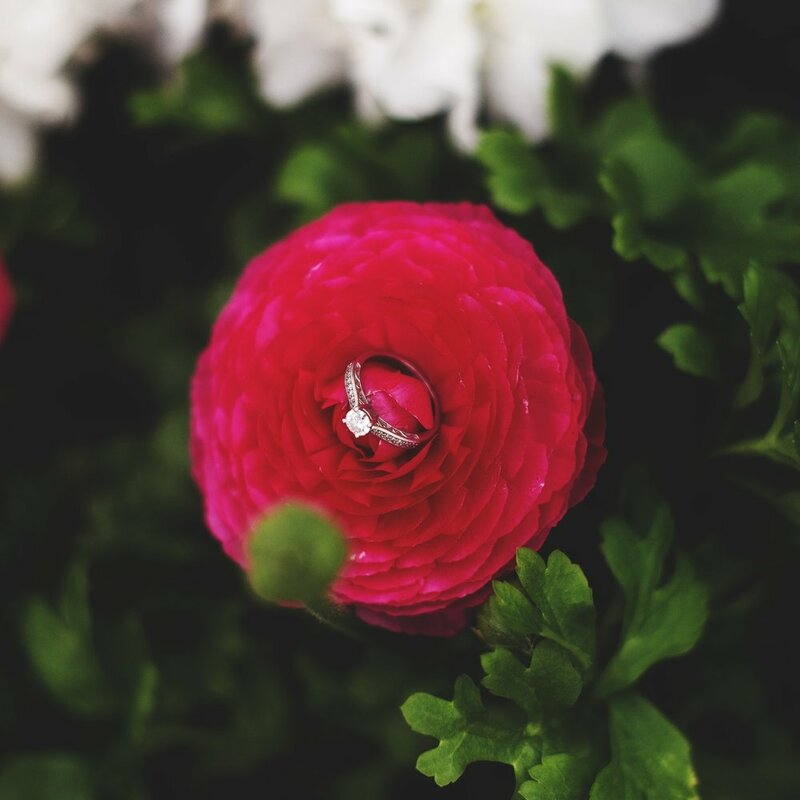 What do you love most about your ring? S: Is everything an acceptable answer? My ring is the perfect size for me, the main stone is square set with some baby bling surrounding it. I love how it tapers into the stone and the custom design on the side of the ring. C: It's unique, it's beautiful, and it fits our personalities. S: We met in Chicago while I was in graduate school. Chris' brother was in the same graduate department so we met at Archie's Bar and played Jenga while he was visiting his brother for vacation. C: I was visiting my brother and some of his graduate student friends in Chicago. One of them turned out to be a pretty cool girl--so we struck up a long distance relationship. Where was your first date? S: Garfield Park Conservatory. We spent time walking around the gardens, I made jokes about walking on water cause I'm so wonderful, and then we grabbed dinner and played trivia at a nearby bar. C: Garfield Park Conservatory in Chicago. Where’s your favorite hidden gem in Cincy? C: I don't visit Cincy too often, but last time we were there, we were at Rhinegeist brewery, which was a great place if you're in to beer and bags/ping pong. What other local Cincinnati businesses do you love? S: Businesses on Vine St. I don't remember any names, but I love looking at the shops that sell art gifts and crafts! S: April 25th because it's not too hot and not too cold... all you need is a light jacket ;) But really, our date days/nights vary according to Chris' work schedule since he works swing shift. Our favorite dates are outdoor dates (as long as it isn't toooooo hot!). We recently took a weekend getaway to the Smokies and enjoy taking our pup on hiking adventures. I also love dates where we go to local breweries or restaurants. C: We both love spending the day frolicking in nature. Our ideal date night? Sometimes you can't beat a home-cooked meal and Redbox movie.